A lonely housewife lovingly cooks a spectacular lunch for her husband at work. Regrettably he has lost interest in her and her attempt is meant to rekindle a spark. The feast is accidentally delivered to an accountant who regularly has his order made by a local restaurant. After her husband comes home, he offers no reaction to the delectable lunch and she realizes he never even received the meal that she prepared. However she’s intrigued that the metal tins have come back completely empty. This inspires a correspondence with the stranger via messages passed back and forth in the containers. The Lunchbox is dependable comfort food that still manages to be a little unconventional. Our tale takes place in Mumbai, India. We’re introduced to their historically reliable delivery system where a network of 5,000 dabbawalas deliver lunches to office workers so they can eat a home cooked meal. The picturesque culture adds a uniqueness to the story at hand. Actor Irrfan Khan (The Amazing Spider-Man, Life of Pi) is Saajan, a withdrawn widower and actress Nimrat Kaur is Ila, the lonesome woman with whom he converses through notes. They’re two yearning souls and they engage our emotions. In this age of social networking and email, the quaint reliance on handwritten notes is rather poetic. Their interaction touches the heart. The emotion feels fresh and innovative despite the fact that the narrative concept really isn’t. This subject has been done before. Most famously with The Shop Around the Corner which in turn was the basis for You’ve Got Mail. It’s worth mentioning the supporting players as well. Actor Nawazuddin Siddiqui as Shaikh, his replacement at work that Saajan must train. Shaikh’s passion for learning is infectious. There’s also Ila’s hilarious friendship with her never seen, but loudly heard upstairs neighbor. Ila affectionately calls the woman “Auntie” and her advice is good as gold. For a movie that relies heavily on the seductive qualities of food, The Lunchbox rarely dwells on the culinary delights prepared. It’s hard not to think the filmmakers missed a golden opportunity to seduce the audience with the wonders of Indian cuisine. After all, in this parable food speaks louder than words ever could. What we do get is a nice romance that unfolds in a very delicate and deliberate manner. Ila is melancholy but radiant. Saajan is a stoic sourpuss. Both mature as a result of knowing each other. There’s real drama in their interaction. At times it’s so subtle and precious, we have to fill in the blanks as to what people are feeling. This translates into what they ultimately do. I won’t spoil the conclusion, but it’s as if the screenwriters think a tidy resolution is too predictable. Still, there’s a lot to love, particularly the sensitive relationship that evolves among the principals. It’s just that the desultory ending is a serious letdown after such a promising buildup. I found it frustratingly unsatisfying. The finish left me hungry for more. This entry was posted on May 28, 2014 at 11:11 pm and is filed under Drama, Romance with tags 2014. You can follow any responses to this entry through the RSS 2.0 feed. You can leave a response, or trackback from your own site. 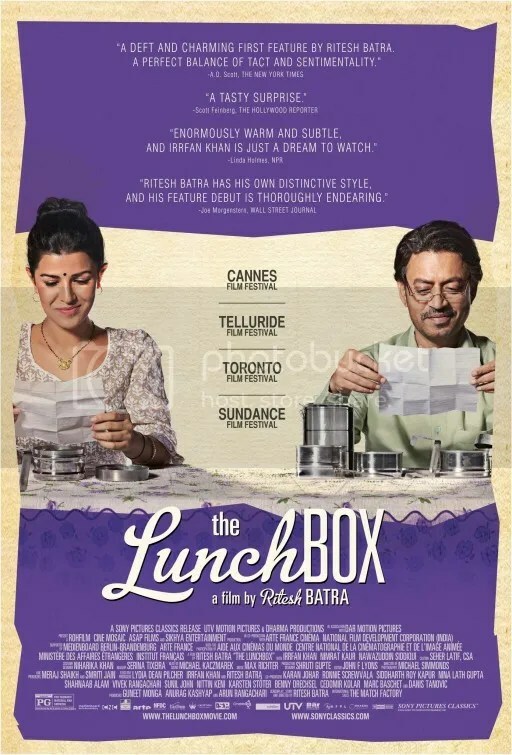 The Lunchbox was India’s entry in the most recent Oscars. It didn’t quite make the final cut, but that’s not to say it isn’t a very worthwhile film. Agree with your point that they missed an opportunity by not showing more of the colorful food. But I think that the intention was to make the people connect via food. With people getting the emphasis rather than cooking. Which makes this film 180 degrees away from Chef. But the thing of it is – when I saw The Lunch Box, Chef was still a month and half from its opening. So at the time, I didn’t come to that conclucion about the film might have been better with more attention given to the preparation of the meal. There was one such scene, and after seeing Chef, now the point becomes obvious. I’m wondering if Chef factored in to your review of The Lunch Box. I saw this film back in April and was quite impressed. It was the contrast of the leads that was so tasty. The underplayed, inwardly turned Irrfan was so subtle in his mannerism, while Ila was so vibrant. From another angle – Lunch Box is still playing here in the USA, and doing quite well at the box office. However Chef didn’t really affect my review of this film any more than movies like Chocolat or Babette’s Feast did. I’m still very impressed by the picture. The leads were very good and I recommend seeing it. The lunchbox was actually released in then U.S. on February 28, 2014. Although it really didn’t go wider until late April. The fact that this little film continues to play and has grossed $4 million is impressive. Disappointed. I was in love with this during the whole movie. I love foreign films. The problem I had of course, was the ending. I wanted a satisfying one, but left, cheated. I still give it 3 1/2 stars. About 90% of this movie is winning and then in the final 10% they drop the ball. It’s a shame because it’s the last impression we’re left with. I haven’t actually seen Youve Got Mail (for reasons unknown) but I feel like I must. Completely forgot that that is a very similar premise. But this felt utterly refreshing. The ending was a little ambiguous, but I feel less so than Le Weekend (obviously an entirely different film), a film I have just seen and haven’t been able to form an opinion of yet. Sometimes a little ambiguity is good – like in A Separation. THIS film was so romantic it called out for an ending that matched what came before.